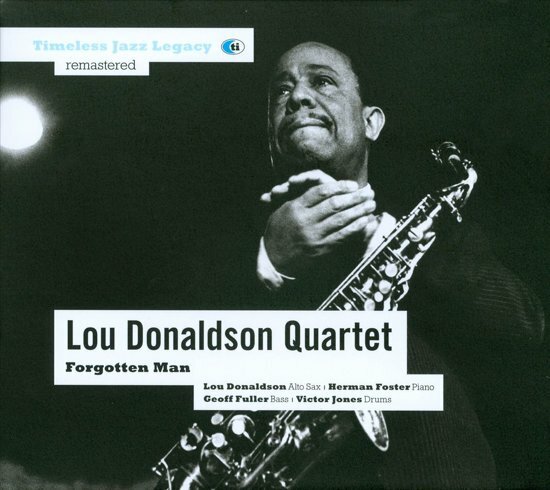 On "Forgotten Man" alto saxophonist Lou Donaldson improvises, as he does during his concerts, to four sorts of themes: own compositions as the 32-measures counting "Tracy", jazz-standards like the samba "This is Happiness", "low down blues" such as "Wiskey Drinkin' Woman" and at last Charlie Parker-vehicles like "Confirmation", "Melancholy Baby", "Don't Blame Me" and "Exactly Like You". He expresses himself on this record in a typical post-Parkerian style. Striking is his choice of the material to be improvised in the form of attractive and charming "songs" with a melodic line. In his ballads he evokes something of the purity of a Johnny Hodges. As a creative artist he joins an innate liking for the melody to a special sense for the re-creation of the themes into own flesh and blood. In this way he carries on "Bird" Parker's message with almost the same instrumental virtuosity. His sonority stands for a true revelation. His tone possesses this special vibration which made Parker so touching during his golden ages. It leaves a sophisticated, delicate and muffled impression. Moreover, Donaldson is served by a natural and faultless timing. His swing of performance links up with the mainstream jazz and the postbop. Technically he experiences not one difficulty to cast the ideas that are flowing through his mind into a suitable form Since he does not reflect Parker's torture in any way, he appears more classicistical to us. His chorusses seem to be carried by a profound lyricism, the basis of all good music. On top of this he affirms on this album his personal and wordly approach of the blues, which gains in relief thanks to his vocal contribution and his ironical undertone. In this field, we consider him even as one of the greatest saxophonists of the contemporary jazzscene. Indeed, these interpretations show that Lou is no longer a "forgotten man", but has recovered his own strong identily. Together with the prominent Phil Woods and the enthusiastic Richie Cole, he probably cinstitutes the presentday top of altosaxes in the postbop-idiom.